Here we see the spectacular cosmic pairing of the star Hen 2-427 — more commonly known as WR 124 — and the nebula M1-67 which surrounds it. Both objects, captured here by the NASA/ESA Hubble Space Telescope are found in the constellation of Sagittarius and lie 15,000 light-years away. The star Hen 2-427 shines brightly at the very center of this explosive image and around the hot clumps of surrounding gas that are being ejected into space at over 93,210 miles (150,000 km) per hour. Hen 2-427 is a Wolf–Rayet star, named after the astronomers Charles Wolf and Georges Rayet. 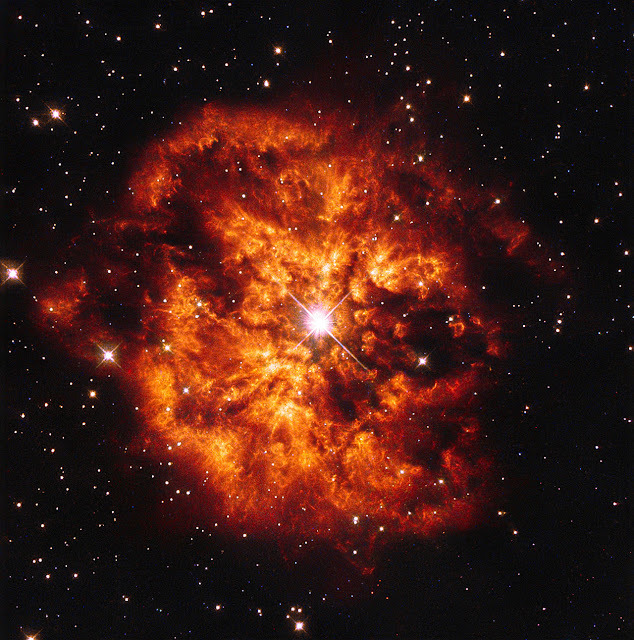 Wolf–Rayet are super-hot stars characterized by a fierce ejection of mass. The nebula M1-67 is estimated to be no more than 10,000 years old — just a baby in astronomical terms — but what a beautiful and magnificent sight it makes. HERMOSO CUADRO QUE PINTA EL INFINITO .JAMAS UN PINTOR LO HARÍA MEJOR . Cuando hace referencia de una dirección y una velocidad, siempre me pregunto hacia donde.